In this September 2017 photograph, humanitarians work through the night to load relief supplies onto an inter-agency convoy bound for east Ghouta, Syria. Thousands of civilians in east Ghouta now have life-saving food and medical supplies after the first aid convoy in nearly three months reached the besieged enclave just outside the Syrian capital of Damascus, the top United Nations humanitarian official in the country said on Friday. “Whilst this development is welcome, it is absolutely insufficient. 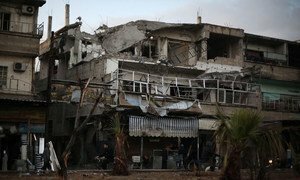 The people reached represent 2.6 per cent of the 272,500 people in need in east Ghouta,” the Humanitarian Coordinator for Syria, Ali Al-Za’tari, said in a statement Friday. The supplies were delivered on 14 February. Aid workers have had no access to the besieged city for 78 days. However, other supplies, including much-needed water and sanitation, education materials and non-food items, such as kitchen sets, blankets and plastic sheets, were not allowed to be loaded in the convoy, added the UN official. “Families are forced to skip meals, some only having one meal a day. A young ailing girl informed the team she has been eating yogurt and nothing else,” noted Mr. Al-Za’tari. In addition, the stocks of basic commodities in the market are running dangerously low and prices are prohibitively expensive for the vast majority of people. The rations delivered by the convoy will be shared among families, with five families sharing one basket. This is not enough to sustain them for long and the impact of increasing levels of food insecurity – especially on children and pregnant women – is evident. The UN team witnessed a number of cases of severe acute malnutrition amid growing reports of an impending crisis. Healthcare workers at Shofiniyeh hospital reportedly screened 317 children under five in the last two weeks with 69 cases of acute malnutrition and 127 of children at risk. Furthermore, caesarean-sections (C-sections) now account for 25 per cent of all births, likely caused by malnutrition among women and their lack of strength to give birth. The UN team also saw expired anaesthetics, the use of which has resulted in two deaths; and with vaccines running low, hundreds of children are feared to be at risk of disease. Reports of cases of communicable diseases, such as tuberculosis, typhoid fever and scabies have emerged. Furthermore, with flare up of hostilities the number of people in need of urgent medical evacuation have also increased significantly. The fighting has resulted in a surge of new displacement, with reports of hundreds of families desperate enough to seek refuge in other parts of east Ghouta – many of which are not safer – than the places they were forced to flee. “People in need must be served, wherever they are. If Nashabiyeh is a sample of communities in need, then the situation is far graver than imagined,” said Mr. Al-Za’tari, calling on all parties to the conflict, and those with influence over them, to allow immediate, safe, sustained and unimpeded humanitarian access to all in need – particularly those in besieged and hard-to-reach areas. “To do so, we repeat our call for an urgently required one-month cessation of hostilities. We will continue appealing for access to all those in need, and remind those responsible of their obligation to grant it under international humanitarian law,” he added. The conflict in Syria is now spilling over the country’s borders amid increased military intervention from multiple sources, a senior United Nations mediator said on Wednesday, warning that civilians are being killed on a horrific scale and the crisis is at one of the most “dangerous and worrying moments” in over four years.